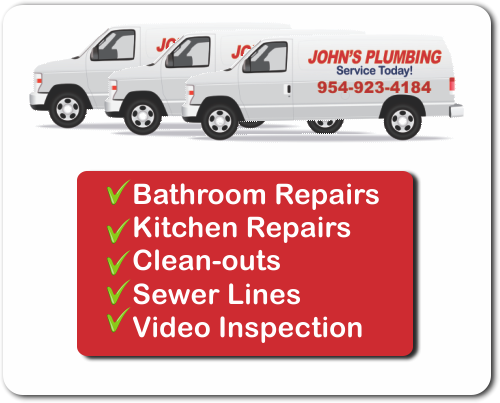 John's Plumbing has been providing Dania, Florida Plumbers that are known for their affordable and dependable service since 1984. Your next plumbing project or plumbing emergency will be in good hands when you trust our skilled technicians, who will handle your work efficiently using the knowledge we have gained over years in the business. Our reputable service history reflects a guarantee of quality work by our licensed and certified team. Dania Florida Plumbers - Johns Plumbing - Our Plumbers Are Ready To Help You! Offering a 24 hour emergency line, John's Plumbing is dedicated to providing our clients with quick, quality service when they need it most, providing an estimate to reflect the work to be done and taking time to explain the process. When you have problems that originate with a backflow or sewer issue, or if you discover a small leak or broken pipe, do not hesitate to call the Dania, Florida Plumbers that residents and businesses trust. When you are in the planning stages of your project and know that you will need a plumber, give us a call for a free estimate. Providing Dania, Florida with plumbers that are available for your kitchen and bath remodels as well as new construction projects, John's Plumbing has been dedicated to serving our clients since 1984. Think of us when you have emergency plumbing needs or when you are planning your next project.